Many people know about walkie talkies. In fact, they use this gadget frequently. However, if you ask them which the best walkie talkies are, many will just give you a stare. This is because many just picked an item without paying much attention to it. Others simply went for a popular brand, while some looked at the most affordable. Such blind decisions usually don’t give good results. The communication may not be effective because of poor range, the channels may be very limited, or the power may not be very good. Other areas that need focusing on include weatherproofing, ruggedness, private codes, weight, size, weather alert, and cost. 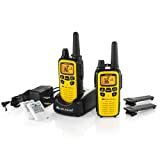 This two-way radio set has a good range of up to 1.9 miles (3000 meters). The set comprises of 4 elegant black and orange pieces that are suited for serious communications as well as fun. The devices come in a rugged design to bear the outdoors and frequent use and operate on both GMRS and FRS bands and support up to 22 channels. This makes them effective in most areas. Thanks to the noise canceling, the sound quality is good even in areas where there are some obstacles. The built-in LCD backlit helps you to scan for channels easily. 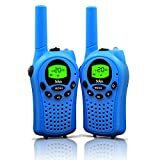 These blue-colored walkie talkies are very elegant and are perfect for kids. They are made from a tough material to tolerate falls, knocks, abrasion, dust, dirt and more. The accessory has a range of up to 5 miles and supports 22 channels and FRS and GMRS bands. The Smart PMR system automatically scans for channels whereas the built-in flashlight illuminates your path. The device is powered by 3 AAA batteries which will last for as many as 9 hours on standby and 3.5 hours when used nonstop. It also features crisp sound, adjustable volume level, and auto squelch function for blocking background noise. 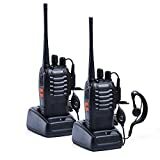 If you wish for a walkie talkie that covers a long range, then this pair from Midland is the right choice. The units have a range of up to 30 miles making them among the best in regards to the distance. They score highly when it comes to channels since they support 36 channels in GMRS band. They feature 121 privacy codes for the best confidential communicating and come in a bright yellow case for better visibility. The walkie talkies are sturdy thanks to the high-quality material and engineering and support Weather Scan and NOAA Weather. 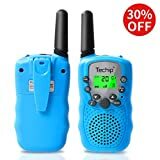 Kids will definitely enjoy communicating with this blue-colored walkie talkies. They come in a kid-friendly design for added fun and are made of tough materials that won’t break, dent, crack, or scratch easily. The lightweight units are easy on the hand and have a range of up to 3.1 miles. The mini 2-way radios support both FRS and GMRS bands and up to 22 channels. They are well-known for their clear sound even in a noisy environment, the clear backlit LCD screens and adjustable volume level. For improved convenience and safety, the unit can be attached via a belt clip. 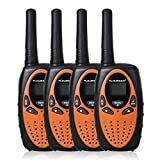 These walkie talkies are perfect for business (supermarket, construction…. ), security, and recreational activities such as biking, hiking, and field survival. They are very light and easy to carry around and can be used indoors and outdoors. The pair works with UHF 400-4570MHz, supports up to 16 channels, and has a range of approximately 2 miles. They are very rugged and retain their shape and integrity even after being dropped many times. Good and clear communication is maintained thanks to the DCS and CTCSS Function that minimizes noise and also blocks interference signal. The included LED flashlight comes handy for illumination or to pinpoint your location in case of an emergency. 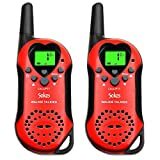 Your kids will love these walkie talkies. They are designed for children and will help them stay in touch while cycling, hiking, camping, survival, and other fun activities; they look very trendy and classy courtesy of the red color and stylish design. Although suited for kids, the 2-way radios have a decent range of up to 5 miles and support 22 channels. They feel light on the hand, come with a clear LCD display and easy-to-operate buttons. This set works with both GMRS and FRS bands. It’s powered by 3 AAA batteries that can last for up to 3.5 hours when used continuously or 9 hours on standby. 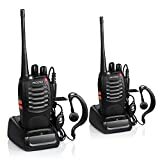 With these walkie talkies, you will be able to maintain clear lines of communications. They are suitable for many applications including supermarket, outdoor fun, security, kids care, amusement park, construction, cycling, marketplace, and hiking. They have a very clear sound that is free of distortion or noise; operate on UHF 400-470MHz frequency and support 16 Channels. They can last for a long period thanks to the rechargeable 1500mAh battery. You can however even extend the d charge duration by activating the Power-saving feature. The robust material and rugged construction ensure they can handle the outdoor, falls, bumping against other objects, and rough handling as well. 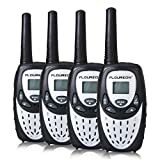 These Floureon 2-way radios are considered the best walkie talkies in the market. They are ideal for many situations including kids care, amusement park, construction, supermarket, and security. The devices are quite light and handling them is very easy. However, although light, the 2-way radios last for a long time even when handled roughly. The 4 pieces come in an elegant silver color and have a maximum range of 5000 miles in the open. They operate on UHF frequency, FRS and GMRS band, and support up to 22 channels. The devices run on 3 AAA batteries and feature a clear backlit LCD display. 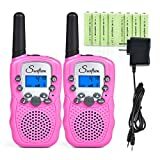 These pink-colored walkie talkies will make perfect gifts for your kids. They are very stylish and trendy just the way kids like them and are also very effective. The devices come with a user-friendly design for quick and easy communication and are also well-made from tough materials to put up with regular use. It operates on 462-467 MHz FRS/GMRS band, supports up to 22 channels, and has a range of up to 9000 feet. The rechargeable batteries put out a good performance and last for over 4 hours while recharging takes approximately 2 hours. 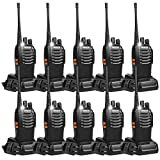 This complete set of walkie talkie is great for security, restaurant, supermarket, warehouse, survival, construction, cycling, amusement park, and mall, and many other places. The 10 pieces are very portable and feature an original earpiece for improved communication as well as a hands-free experience. They operate on UHF 400-470 MHz frequent range and on 16 channels. They can tolerate everyday use, falling, and exposure to the elements thanks to the solid construction. The LCD is clear and visible whereas the built-in Led torch improves visibility in the dark.